Despite being separated by more than 1,000 miles, students from Islesboro Community School working with the Hurricane Island Center for Science and Leadership partnered with the Chicago Eco House last month to kick off a year-long sustainability project. The partnership was forged after both organizations won our 2017 UL Innovative Education Award and attended a summit to collaborate on special projects that further their missions. The project will allow youth from both organizations to come together to use their skills to modify the “Sea Rocket”, a low-cost submersible designed byHAWX Open Ocean to take vertical data samplings underwater. Currently, the Sea Rocket is dropped off a boat into the ocean, collects data on the way down, hits the sea floor, releases a weight and rises back up to the surface for data recovery. From a sustainability standpoint, the weight left at the ocean floor is the problem. The island students’ goal is to create a working Sea Rocket with a biodegradable weight and release mechanism that will not further pollute the ocean. This winter, the Chicago Eco House students will use a 3D printer available to them to draft and 3D print prototypes of the ring mechanism that holds the weight for Islesboro students to test. The design process and testing period will also include the Islesboro students harvesting kelp from their aquaculture site to create a biodegradable sand bag for the weight. Islesboro students will finally incorporate both the 3D printed ring mechanism and the kelp sandbag into the Sea Rocket. 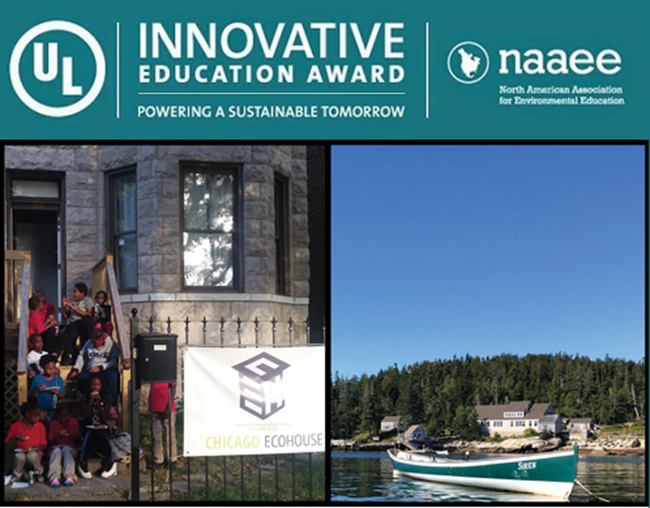 Once complete, the Islesboro students will test the full prototype and share information back to the Chicago Eco House students to help with design iterations. The Sea Rocket project will challenge the students’ project-based science skills and encourage them to develop leadership roles in a collaborative classroom environment. Conferences like our ULIEA leadership summit provide opportunities for like-minded organizations, like Chicago Eco House and Hurricane Island Center for Science and Leadership, to increase the scope of their work and share best practices that keep their staff on the cutting edge of innovative science education and youth leadership development.